VPN users beware: Firefox and Chrome have a security vulnerability that may leak your IP address unless you’re using a full-featured VPN like NordVPN. Read on to find out what a WebRTC leak is and how you can protect yourself. WebRTC (Web Real-Time Communication) is an open-sourced tool that allows browsers that use it to form real-time, peer-to-peer connections with the websites they visit. 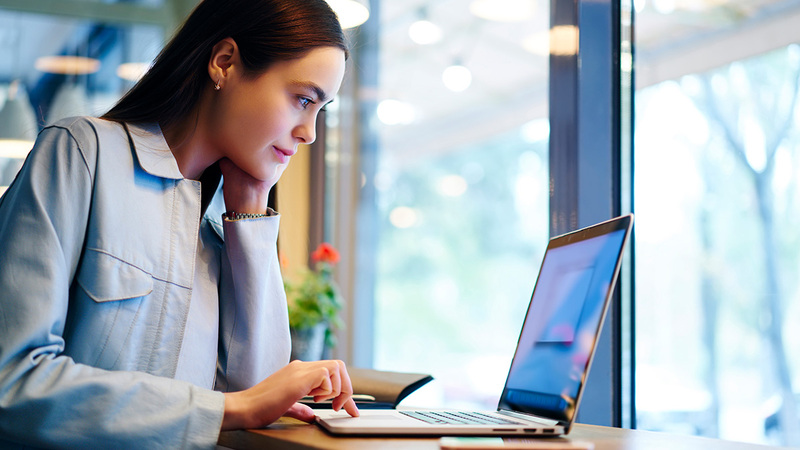 This allows your browser to do things like send live audio and video feeds back and forth between you and another participant online – without having to download any additional software. This is a non-proprietary protocol that allows any website to plug in and make such a connection (with your permission). It does this by establishing special communication channels from the browser that communicate with the website you’re visiting and exchange information (including your IP address). Those channels, however, may also bypass your encrypted tunnel as well. This is a problem. Any website you visit can potentially request and access your true IP address – despite your VPN. When this vulnerability was first discovered, it gave VPN providers (ourselves included) quite a scare. The worst part is that this is part of the basic functionality of WebRTC, so it can’t really be “fixed.” It’s up to the user to find ways to block these leaks or disable WebRTC entirely. There are a few ways to do this. By far the simplest way is to block WebRTC leaks by using NordVPN. Whether you’re using our regular VPN or our browser plugins for Firefox or Chrome, either will block any unwanted IP address leaks through WebRTC while allowing authorized WebRTC connections to continue under your anonymous IP address. WebRTC requests can also be blocked from your browser, but this process will be a bit more complicated. Furthermore, unlike with NordVPN, blocking WebRTC leaks using these methods will often disable WebRTC functionality completely. Disabling WebRTC on Chrome is tricky, and we strongly suggest using an extension to do so. That’s because the extension-free way involves manually editing setting files that can potentially make your Chrome browser malfunction if you do it wrong. WebRTC Leak Prevent is the leading Chrome extension for preventing WebRTC leaks. As the developer has noted, this extension only changes WebRTC’s security and privacy settings – it doesn’t turn WebRTC off. Fortunately, Firefox does have a built-in way to disable WebRTC. It can be hard to find if you don’t know where to look, so follow these steps! Write “about:config” into your browser bar and hit Enter. You will be prompted with a warranty warning. Click on “I accept the risk!”. You will be presented with a long list of settings, most of which you probably shouldn’t touch. There will also be three columns showing the status of the setting, the type of setting, and its value. To find the one you need, open your page search function (by default: Ctrl+F on Windows, Cmd+F on Mac) and look for “media.peerconnection.enabled”. Once you find this setting, it should have the type “boolean” and value “true”. Double click on it so that the value changes to “false” and the status changes to “modified”. That’s it! This will disable all WebRTC, so it will also disable any websites that use it to deliver their services. Disabling WebRTC on Safari is possible, but the option is a bit harder to find than on Firefox. That’s because WebRTC was only recently implemented, and is still considered an experimental feature that only developers would want to fiddle with. If you follow these instructions, however, you’ll find it easily! 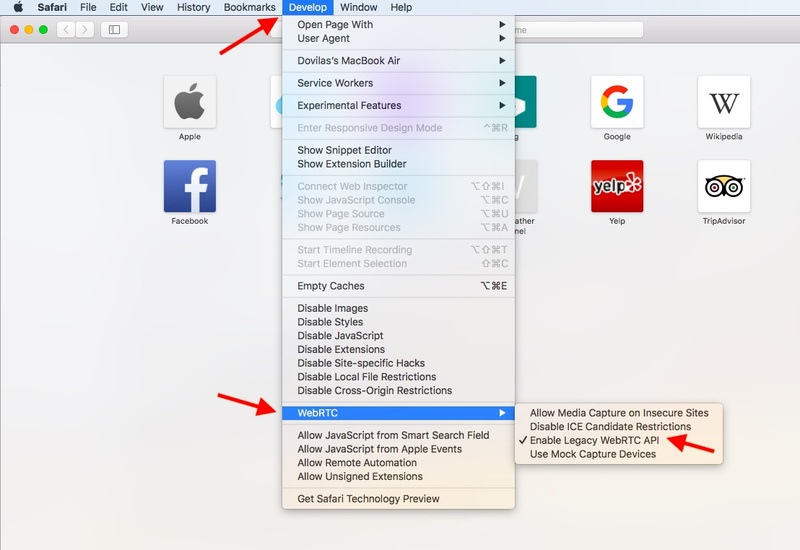 Click on “Safari” and choose “Preferences” from the drop-down menu. 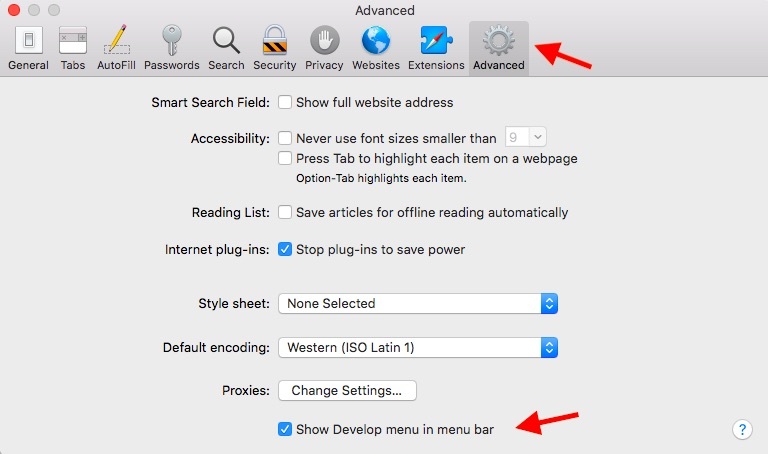 Click on the “Advanced” tab and check the checkbox that reads “Show Develop menu in menu bar”. Click on the new “Develop” tab in the menu bar and choose “WebRTC” from the drop-down menu. If “Enable Legacy WebRTC API” is checked, click on it to disable it. That’s it! Your Safari is now free of WebRTC leaks. However, this may also prevent WebRTC-based services from working in your browser. Blocking WebRTC leaks is a good start to securing your online activity, but it’s not enough. If you use NordVPN’s browser extension or VPN service to block these leaks, you’ll already have a collection of tools at your disposal to help secure yourself, including CyberSec and Onion over VPN. However, you’ll also want to read about our other tips on how to stay private and secure. Click here for a free trial of NordVPN!